According to the Oxford dictionary, “community spirit” is “a feeling of involvement in, and concern for, one’s local community”. All it takes is a small group of enthusiastic likeminded individuals to make a big difference. Many fine examples of community spirit exist in Tetbury, amongst them the Feoffees, the Lions Club of Tetbury (the brains behinds this marvellous, award-winning, magazine) and, I would argue, Tetbury in Bloom – as I hope that I have demonstrated through my articles describing many of our many activities over the course of the last year.  Audrey and Roy Angell, Di and Mont Bryan, Charlie and Pam Cleaver, Joan and Mike Kniveton, Mary Lennie, the residents of Five Trees Close and Prince Court, and Sue and Charlie Grene for opening their gardens in support of the eighth Open Gardens Day; despite the miserable weather, it was another big success attracting visitors from across the south west and even as far a field as Italy!  Bristow Photography, Clark and Maslin, Jesters Antiques, Lyndseys, Tetbury Fish & Chip Shop, Tetbury Hardware, and the George Veterinary Group for their sponsorship of another enjoyable Race Night and Highgrove Enterprises, which also sponsored the prizes for the “owners” of the winning horses.  St Marys’ Parochial Church Council, Tetbury Town Council, Tetbury Upton Parish Council, The Rotary Club Of The South Cotswolds, The Women’s Institute, and all the individual residents of Tetbury who kindly made donations and for those that voted for us in the Tesco “Bags of Help” scheme last summer. Merry Christmas and a Happy New Year from the Tetbury in Bloom team: Sue, Stephen, Mel, Ian, Kevin, Frances, Emma, Dee, Anne, Jane, Charlie, Sue and myself. Leaves are falling but it is not too late to plant daffodil bulbs and other spring flowering bulbs for a magnificent start to next year’s display. Instead of planting bulbs this year, the Day Team will be using the time to refurbish some of the flowerbeds. The formal beds in the churchyard, as mentioned in last month’s article, should now have a new look. The Diana Memorial bed on The Green will be thinned out. Many of the phlox and Micklemas daisies will find new homes giving the Princess Diana roses (which still do so well after almost 20 years) more space to breathe again. Apart from the autumn task of thinning out and refurbishing beds, the team also plans to replace the seven tired looking ‘cattle troughs’ in the town centre, with smart new ‘easy watering’ containers. This will be a time consuming job, not only installing the new troughs but transferring the existing box trees and tete a tete bulbs from the old troughs to the new ones. The new containers will, however, save a lot of time and effort in the future. Come the last week in November, in support of our ‘sister organisation’ Christmas in Tetbury, the Day Team will also be found under the Market Hall, dressing the town’s Christmas trees that will adorn the shops. We held another very successful Race Night on Saturday 28th October. Our grateful thanks go to the businesses that kindly sponsored the races – Bristow Photography, Clark & Maslin Highgrove Enterprises which also sponsored the race winner’s prizes, Jesters, Lyndseys, Tetbury Fish & Chips, Tetbury Hardware and The George Veterinary Group. Many thanks also to everyone who came on the night, ‘bought’ the horses and placed their bets. Finally, a special thank you to my sister-in-law and brother-in-law, Lorraine and Nigel, who thought they were visiting us for a weekend of fun but who helped out on the evening by taking bets. We know how to enjoy ourselves! 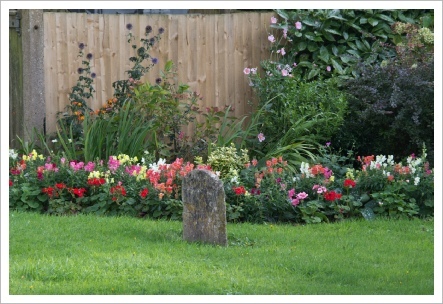 I mentioned earlier in the year, that we have plans to refresh the churchyard. We have installed more benches to enable visitors to enjoy the peaceful surroundings. The so-called “Ange bed”, located opposite to the main door, has never looked so good. Originally created to make sense of a few lone shrubs planted in the grass, the bed was cut and then filled with spare plants from Ange Morrissey’s garden. It is now a glorious assortment of sustainable plants including hydrangea, berberis, Christmas Box and spotted laurel, all complemented by antirrhinum in pastel shades in the summer and a beautiful array of tulips in the spring. This flowerbed is a fitting tribute to Ange and Pete, who have stepped down from Tetbury in Bloom. We thank them for their commitment and hard work over the last decade. Over this coming month the formal beds will take on a slightly different look. The penstemon will be thinned out and hardy fuchsias and silver leafed euonymus will be added amongst the dark-leaf heuchera. They will provide welcome colour from July to the first frosts in November, provide structure throughout the year and fit in with the plum and deep red colour scheme. With shelter from cold wind, fuchsias will grow perfectly well in either full sun or partial shade. We have used them to good effect in the Anniversary Gardens and alongside the Dolphins Hall. Fuchsia appreciate some shade at the hottest part of the day during very hot summer days and will be ideally suited to the churchyard. Tickets are now available for our annual Race Night fundraiser on Saturday 28th October. All profits go towards Tetbury in Bloom and Christmas in Tetbury projects. Tickets cost £5 per person and can be obtained from Sue Hirst on 504213. More details can be found on our website www.tetburyinbloom.org.uk or look out for in our advertisement in this month’s Tetbury Advertiser. We look forward to seeing you for a fun evening. 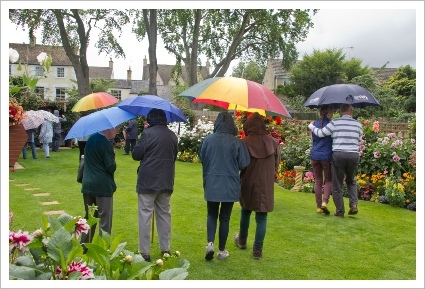 Despite the occasional showers on the afternoon of Sunday 30th July, Open Gardens Day was another great success. Visitors travelled to Tetbury from across the region; from Worcester in the north to Trowbridge in the south and from Whitney in the East to Bristol and Newport in the West, especially for the event. One couple, who travel to the Cotswolds each summer to avoid the heat of Italy, returned for a second year and, like so very many of you had a wonderful time. A very big thank you to everyone involved, particularly those who opened the gardens, their helpers and the Womens’ Institute for running the café. The Anniversary Gardens (at the end of the Ferns) was well received by those who visited. The garden is surrounded by an impressive stone wall on three sides, which adds privacy and character to the space and means that it is unknown to many who have lived in the town for many years! This year it has undergone a make-over. Instead of planting summer bedding we have added lots more lavender, spectacular allium Sphaerocephalon (“drumsticks”) and fuchsia to the existing flowerbeds to great effect. We are delighted that Edwina (93) enjoys the results, using it as an alternative to her own garden! We are also grateful to the Tesco “Bags of Help” scheme and to everyone who added their tokens to the Tetbury in Bloom box – “every little helps” as they say and it helps us to continue our work! 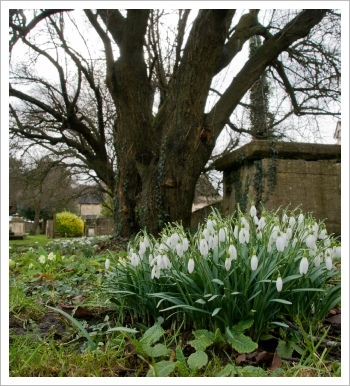 This year marks eight years of Tetbury in Bloom Open Gardens Day – where has the time gone? It is a rare privilege to be invited into private gardens not normally open to the public. Come along on Sunday 30th July to gain inspiration, talk to garden enthusiasts or simply enjoy a wonderful day out. Open Gardens Day is the perfect example of team work and a great example of what can be achieved when different local people and groups pull together. By that I mean the creativity, perspiration and dedication of the residents who generously open their gardens. The support of the Feoffees who allow us to use the Market House for the day. The expertise of the Womens’ Institute who will be serving refreshments and a large selection of delicious cakes. All combined with the organisational expertise and warm heartedness of the in Bloom committee. There is also an added bonus of visiting our very own Anniversary Gardens which is located in Eccles Court, between The Ferns and The Chipping. 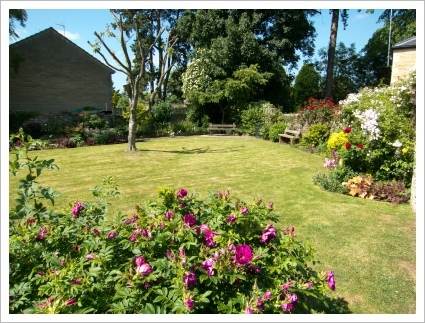 This is a public garden tended by the Tetbury in Bloom team throughout the year. Tickets are available on the day from a stall outside the Market House or from any of the private gardens themselves. 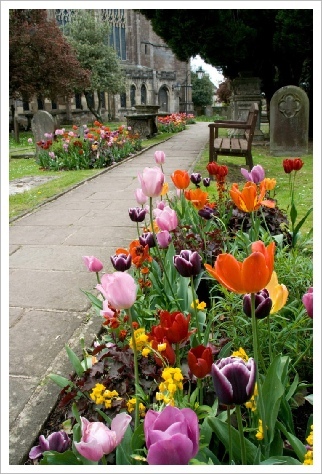 For more details, or to download a map in advance, please visit our website www.tetburyinbloom.org.uk. Alternatively, look out for the advertisement in this month’s issue of the Advertiser. We are delighted to announce that our ‘sister’ organisation, ‘Christmas in Tetbury’ has been selected as one of three local community good causes in the Tesco Bags of Help Grant Scheme. If you’d like to help raise the funds needed to pay for the reinstallation of the Christmas lights and fund the Community Switch On event, which this year will be held on Thursday 7th December, then please add your token to the ‘Christmas in Tetbury’ box, located at Tesco Tetbury, during July and August– many thanks!. June is the busiest month for Tetbury in Bloom. 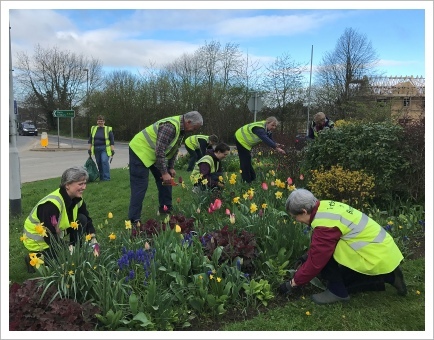 On Tuesdays and Thursdays, in the morning and again in the evening, we descend, like locusts, on the different areas of town to prepare the flowerbeds and plant them with summer bedding, leaving behind an injection of colour not devastation!  Geraniums/ Pelargoniums – trailing and upright varieties are ideally suited to flowerbeds and containers because they withstand hot, dry conditions and flower all summer, with minimum attention, which is important when we have so many flowerbeds and containers to care for. Pelargoniums are available in a wide colour range including vibrant reds and pinks to orange and apricots, fitting in with our colour scheme. We use ‘Horizon’ for the bedding variety and ‘Grandeur Classic’ for the larger zonal type.  Begonias – one of the most versatile of summer bedding plants; we use them to great effect in our hanging baskets for their large flamboyant blooms because they do not require any deadheading! Begonias flower continuously throughout the summer up until the first frosts, representing good value for money.  Antirrhinums – we love them for their architectural flower spikes, which give height, an old fashioned charm and have a long flowering period. We normally work our way around the town. One end of London Road one evening and the far end the next. First we add a mix of manure and general purpose compost to improve the blooms. It is a messy and smelly job but a very necessary one! Then the fun bit can begin. After so many years, we soon get back into the routine. All we need is lots of sun and just enough rain to keep them all watered! We are delighted to announce that we have been selected as one of three local community good causes in the Tesco Bags of Help Grant Scheme. If you’d like to show your support for Tetbury in Bloom and you’re shopping in Tetbury Tesco during May and June, please do add your token to our box – many thanks!. Our grateful thanks go to Eagle Plant Ltd who gave us much support by donating a large amount of gravel for a project we’ve been doing in St Marys’ Churchyard. There’ll be more about the project in my next article. 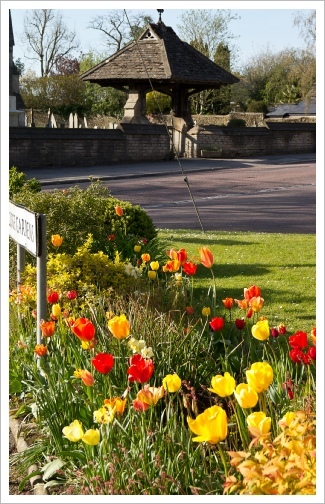 Tetbury in Bloom – Summer is on its Way! As the tulips fade and herbaceous borders burst into life, it is now clear that summer is approaching. May is a busy time for the gardener, Chelsea entrants and for Tetbury in Bloom as we prepare for the summer season ahead. 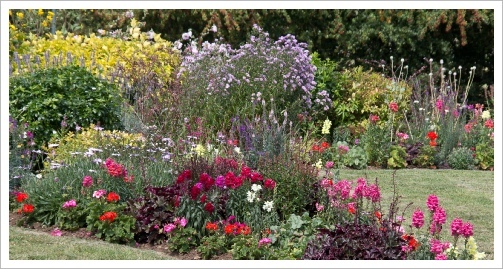 The team is out on Tuesday and Thursday mornings thinning out drifts of hardy annuals, trimming back spreading plants, deadheading any late tulips, weeding the flowerbeds and generally making room for the summer bedding, which we will plant In June after the last threat of frost has passed. Sue is busy planning our work schedule and the logistics to ensure that the right plant combinations and the correct numbers of bags of compost and manure arrive at the right flowerbeds at the right time. With just under 3,500 plants, made up of geraniums, begonias and antirrhinums arriving through the month of June to be planted up in the 33 flower beds and 42 tubs and troughs throughout the town, it doesn’t all happen by magic! Having been mainstays of Tetbury in Bloom for the past 10 years, we are very sorry that Pete & Ange Morrissey have decided to hang up their trowels and retire from the team. We really will miss their enthusiasm and support and wish them all the very best for the future. As the weather improves and the days lengthen, April gives rise to a dazzling display of colour. April is one of my favourite months in the garden because of the tulips. I love the delicacy of the followers, the wonderful colours and the fun you can have from planning different colour combinations. Mum always says that red and pink don't go together but this "rule" doesn't apply in the spring garden! Tulips make ideal "bedding" plants combined with annual or biennial planting. All they need is well-draining, neutral pH soil, a minimum of six hours of daily sunshine and protection from winds. Our original inspiration was the displays at the Abbey House Gardens, Malmesbury. Tulips are a perennial bulb, but cannot always be relied on to come back year after year. We do, therefore, supplement our flowerbeds with fresh bulbs on alternate years, which mean that our displays do not look the same from year to year and, for me, that adds to the magic. Our favourites, chosen for their colour and height, include: Don Juan; Apeldoorn; Florosa, Annie Schilder and Indian Summer, to name but a few. We are still taking orders for our summer hanging baskets which comprise easy-care, trailing begonias in pink, red, orange and apricot shades OR a selection of vibrant coloured trailing geraniums. They will be delivered to your door by arrangement during the second week in June; all you need to do is to install them, water them regularly and give them the occasional feed. Details can be found in our adjacent advertisement or on our website www.tetburyinbloom.org.uk All profits raised help go towards In Bloom projects. If you purchased our hanging baskets last summer and still have the empty containers, we'd really appreciate their return so we can re-use them again this year. We are also seeking volunteers to open their garden to the public on the afternoon of Sunday 30th July. The spring equinox is on 20th March (although meteorological spring begins on 1st March 2017), but for Tetbury in Bloom, the gardening season is already well underway. The current incarnation of Tetbury in Bloom was the vision of Stephen Hirst during his previous tenure as Mayor. Building on the work of the then Town Clerk, Rodger Williams, his initial vision was for Tetbury In Bloom to involve volunteers in a project with the object of improving the appearance of the town. 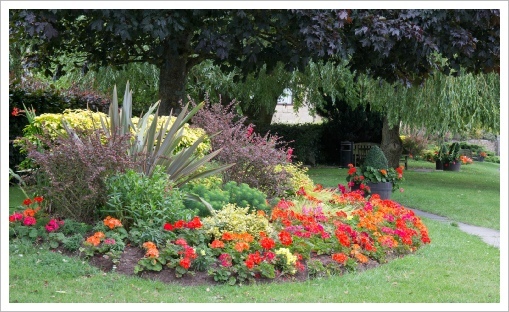 In 2008 there were a number of simple flower beds in the centre of the town that were planted and maintained by the Council. "These needed an injection of interesting plants, a great deal of imagination and the will to improve the town's overall appearance. The in Bloom team provided all these ingredients, in excess, with the result that is very much in evidence throughout the year" said Stephen. On reflection Stephen lists many great achievements: " The Audi Roundabout was a terrific innovation; " The hard work that was put in by the team to achieve five gold medals, culminating in the judges' discretionary award for 'Community Achievement' and overall winner in the Heart of England in Bloom competition in 2010; and attain two silver-gilt awards in the National Britain in Bloom campaigns in 2009 and 2011; " Creating a dedicated team who are out and about in all weathers, caring for all the floral displays throughout the entire growing season and planning for the season ahead in the depths of winter. In Stephen's opinion, however, "the greatest achievement is the beautiful look of the town in summer with the wonderful hanging baskets and the flower beds exploding with colour, fantastic!" This could not be possible without all the watering done by Stephen himself. We have already planned ahead for this year and are now taking orders for our summer hanging baskets which comprise easy-care, trailing begonias in pink, red, orange and apricot shades OR you can choose baskets which comprise a selection of vibrant trailing geraniums. They will be delivered to your door by arrangement during the second week in June; all you need to do is to install them, water them regularly and give them the occasional feed. Details can be found in our adjacent advertisement or on our website www.tetburyinbloom.org.uk All profits raised help go towards In Bloom projects. If you purchased our hanging baskets last summer and still have the empty containers, we'd really appreciate their return so we can re-use them for this year. To arrange collection, please ring Sue Hirst on 504213. Other plans for 2017 are also well advanced and include: Open Gardens Day on Sunday 30th July and the Race Night fundraising event on Saturday 28th October. With Spring just around the corner, it's time to check your garden to-do list. After nearly a decade of writing for the Advertiser, it is sometimes difficult to think what to write but, after lots of positive feedback (thank you Basil and Jeremy) I am encouraged to continue my updates on what Tetbury in Bloom is up to. I am not a natural gardener as my neighbour, Jo, reminds me. It is my love of flowers, (inherited from my Gran and my parents) and owning a house and not a flat or living in student accommodation that got me interested in gardening. Once I joined the Tetbury in Bloom team, originally to help with publicity and organisation, I got hooked and the rest, as they say, is history. Gran always had flowers in the house, even if it was only a simple arrangement of daises in a sherry glass on the kitchen worktop. Better still is to see flowers in their natural habitat. At this time of year I enjoy the anticipation of looking for the first sign of the snowdrops poking through, which herald the end of the winter. Last autumn we added another 5,500 bulbs to the flowerbeds and green spaces around the town; a mix of daffodils, narcissus, grape hyacinths and tulips. This is not everyone's favourite job but the beautiful displays make all the hard work worthwhile. It is not, however, "all work and no play". On 9th December, we were all delighted to celebrate Sue and Dee's birthday over afternoon tea at the Trouble House and on 18th December, we enjoyed the Christmas in Tetbury Wassailing lunch at the Hare and Hounds. Tetbury in Bloom is a wonderful team and I am delighted to be a part of it.